MREs are an excellent option when it comes to building up an emergency food stockpile. With one easy order, you can get 12 full cases, each containing 13,200 to 15,600 calories worth of food. This is more than enough to keep your family well fed through most natural disasters, or other emergency situations. These MREs also contain a wide range of different types of foods, which helps to ensure you’re getting all the nutrients you need to stay strong and healthy. 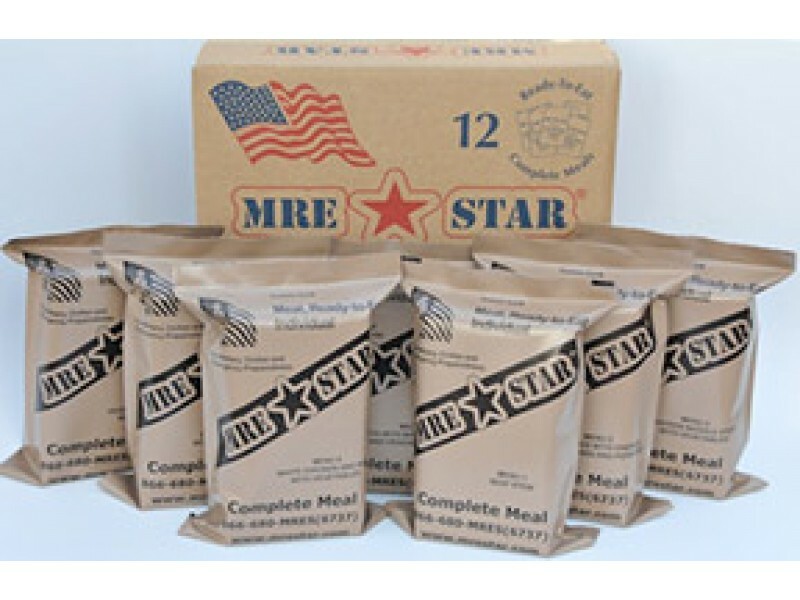 We offer MRE for sale perfect for stocking food for an emergency. MRE meals is akin to buying insurance to protect your family in times of crisis. Keeping yourself prepared to deal with any emergency is the best preventive action you can take to keep you and your family safe and in good health. Survival Warehouse, the leading providers of MRE meals and MRE cases provide the most comprehensive range of MRE meals to ensure every unique dietary requirement is catered for. Survival during a disaster is tough, but having nutritious MRE meals can make the job of surviving a lot easier. Our MRE meals full case without heaters provide intake of 13200 – 15600 calories, more than sufficient to meet the energy needs of you and your family till emergency situations are brought under control. 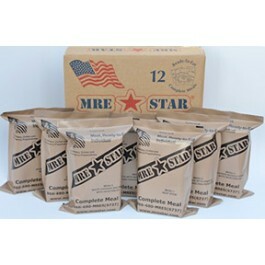 MRE Meals for sale without heaters have a 5 yearshelf life, making them ideal for long term emergency storage. MRe’s require no refrigeration or heating, they can be easily opened up and eaten with minimum fuss or mess. Each MRE case contains a 12 complete individual meals. Each Case of 12 MRE Meals without Heaters includes Entrée, Side Items and Accessories as well as a Drink Mix providing enough variety of nutrients to ensure a well balanced diet. MRE accessory pack includes include spoon, napkin, coffee, non-dairy creamer, sugar, salt, pepper and a wet nap. At Survival Warehouse, we realize how important it is to provide for the dietary requirements of each family member, which is why our MRE Case without Heaters contains different food categories to provide something for each member of the family. Even our side dishes are carefully planned to provide both taste and nutrition, as well as easily eaten by children. Survival Warehouse MRE Meals for sale are used by civilians and military alike, whether it is for disaster preparedness or as part of camping kit. MRE for sale are used extensively by aid workers in rescue and aid missions in areas cut off from the outside world due to disaster. Our MRE meals are also extremely popular among campers and hikers who prefer carrying our MRE meals with them because of their great taste and fast, ready to eat quality. Buy our MRE meals for sale without heaters today to use both in emergencies as well as in outdoor fun trips with family and friends. MRE for Sale offers all multi case purchases to include Free Ground shipping to the lower 48 states. Each complete meal contains an 8 ounce entree, 2-3 sides, a drink mix, and an accessory pack for a total of 1100-1300 calories per complete meal. A complete case will contain 13,200-15,600 calories.